Ortisei (St.Ulrich) Dolomiti SuperSki – or just Ortisei if you prefer – is a fabulous year-round resort with unique charm and local culture. Positioned just a few kilometres away from the beating heart of Selva, Ortisei is a more traditional market town that’s about more than just epic skiing. Medium in size and huge in terms of importance, Ortisei is the administrative and agricultural centre for the region. Which in turn means it lacks that often synthetic/purpose-built vibe that’s common among mainstream ski resorts. The Gardena Valley needs no introduction as an outright mecca for ski-lovers at all levels. Forming part of the wider Dolomiti SuperSki region – the largest in the world – you could spend years here and barely scratch the surface of what’s on offer. The immediate ski lifts on the doorstep of Ortisei may be limited, but you don’t have to go far to find exactly what you’re looking for. And as mentioned, Ortisei has a thriving life beyond skiing, making for great entertainment and enjoyment both on and off the slopes. The pedestrianised centre of Ortisei is home to far more cafés and stylish hangouts than any town of such a size really needs…and all to its credit! The whole place remains wonderfully animated day and night, while outstanding accommodation standards make Ortisei great for families. Topped off with a world of quick and convenient transport connections to the wider SuperSki area, Ortisei delivers on all fronts for all visitors. There are good train services from Italy and most surrounding countries to both Bressanone and Bolzano. 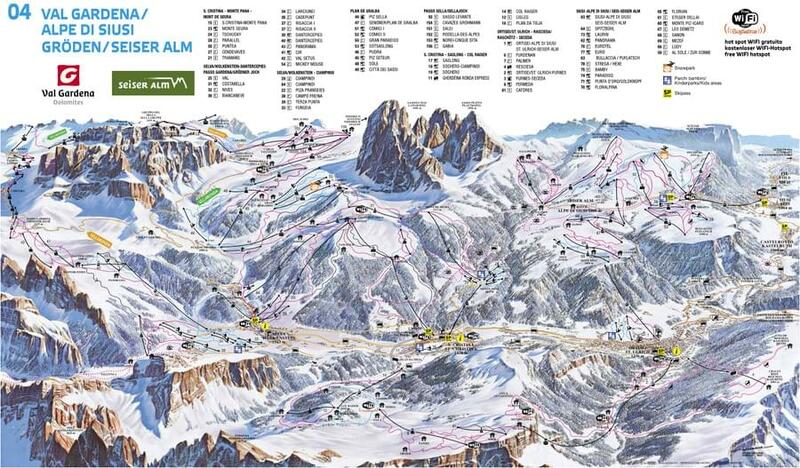 From there, you can take a connecting bus service (shared or private) on to Val Gardena and your final resort. The price you pay for your Ortisei resort transfer will be calculated in accordance with the specifics of your trip. However, you can count on Alps 2 Alps to get you there on-time and in-comfort, throughout the season. What’s more, we work hard to keep all resort transfer costs as low as possible. All of the above will only ever result in our base-rate for ski transfers going down – we never over-inflate our prices at any time or for any reason. We also offer substantial discounts for off-peak, off-season and midweek transfers to Ortisei. If looking for the best possible deals, travelling outside peak season or midweek typically results in the biggest savings. We offer midweek (Monday to Friday) prices with up to 60% discount than weekend prices. Ortisei has a resort altitude of around 1,230m, making for good conditions and a relatively long season. The town itself has around 10 pistes on its doorstep, served by a handful of lifts. However, with more than a dozen other villages and resorts within easy reach, there’s closer to 175km of downhill runs to explore in and around Ortisei. Which along with catering to the needs of newcomers also includes some of the most challenging slopes and off-piste opportunities to be found in the wider region. Few resorts in the area can hold a candle to Ortisei when it comes to family-friendliness. From the gentle slopes to the world-class ski schools to the simply stunning resort centre, it’s the kind of place incredible family holidays are made of. Even when the snow/weather isn’t at its best, Ortisei is packed with amenities to keep the whole family busy. For the best possible prices on all Ortisei ski resort transfers, be sure to reserve your seats as early as possible. Particularly if planning to travel during the peak of the season, the most popular Ortisei transfers fill up fast! If you can’t find the resort or service you’re looking for on our website, be sure to get in touch with Alps 2 Alps for more information.